Download FortCraft APK Game for Androidand iOS. This Game Like a Fortnite Mobile clone Game. Many people who love survival games are waiting for each day to experience Fortnite Royale Mobile. Fortnite Battle Royale Mobile is being released by Epic Games on Android, iOS soon. However, while waiting, why do not we enjoy a similar game? NetEase was one step faster than Epic Games when they released FortCraft. This game is quite similar to Fortnite Battle Royale Mobile, from gameplay, graphics to features. This is NetEase’s controversial action. But perhaps we do not need to worry about this either. While Fortnite Royale Mobile has not yet released, FortCraft is not a bad choice for gamers at the moment. FortCraft retains its unique style of play. In this game, you and 99 other players are taken to a deserted island by a plane. Here, the battle of your existence officially begins. You have to make every effort to survive on this island. There is no safe place on this island, as the map of the game gradually shrinks over time. The most important thing to help you survive is skills, tactics. Only one person can survive. Can you survive in this game? 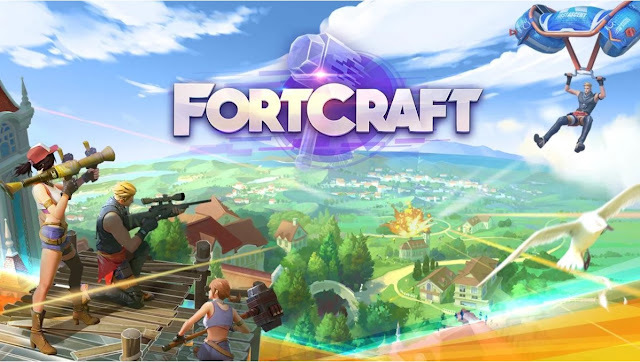 In FortCraft, you not only focus on classic gunfights, but this game also allows you to build bases, defence systems to protect you in a safer way. However, unlike the PC version, you can build in places where the game is indicated, without the need to waste time gathering materials for the construction process. This makes the gameplay of FortCraft faster, more thrilling. In the beginning, you should quickly collect the necessary weapons to get ready for the clashes. There are a few tricks you should know when falling from the plane, notice the other players fall along with you, to help you know how many enemies in the area with you. Since this is a survival game, just one mistake, you can pay the price with life, so every little factor is also very important. The weapon system of the game has many differences compared to the PUBG style games like Fortnite Battle Royale, PUBG: Army Assault or Rules of Survival. Not only military weapons, FortCraft has a bazooka. The bases in the game are relatively certain, so if you have Bazooka you will be easier to destroy the hiding place of the enemy. Because of the limited amount of Bazooka on the map, you should use them appropriately. In addition, you are also equipped with a strong hammer. 2. “com.netease.g91na.gb” folder “android / obb” copy into. 0 Response to "FortCraft APK Game for Android Download"